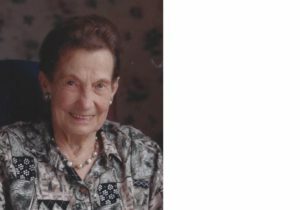 The Erna Rousseau Scholarships are in the memory of Erna Rousseau, a lifelong piano teacher and accompanist from Wabeno. Erna was a large presence in the community when it came to the arts and supporting these programs and the youth involved with them. It’s awarded annually to a student from Wabeno, Crandon, Goodman/Armstrong Creek and Laona. The scholarships are awarded to students who have been involved in the arts in high school and plan on pursuing a college degree in education, art, graphic arts, music, dance, theater or TV/broadcast journalism. Scholarships are also awarded to current high school students to attend visual and performing arts camp and clinics. Since 1997 the fund has thus far given over $6000 in scholarships to area young adults. This post-secondary scholarship is designed to recognize area students who have demonstrated academic success, community service and involvement in the performing and/or visual arts. The amount of the scholarship is $500. This will be awarded to the recipient in the spring semester of his/her second year of college. The scholarship is open to applicants who will be enrolled in an institution of higher learning as an education, music, art, graphic arts, theater, dance or TV/broadcast journalism. The student must carry at least 12 credits a semester and have a minimum grade point average of 3.0 on a 4.0 scale. A letter of recommendation from a teacher or administrator must be submitted to the scholarship committee. Applications must be postmarked or hand delivered by April 1. The Scholarship Committee’s decision will be announced on class night or graduation day. The decision of the committee will be final. These scholarships are designed to recognize area students who have demonstrated success and talent in the performing and/or visual arts. The amount of the scholarship is $250. Two scholarships may be awarded per year. 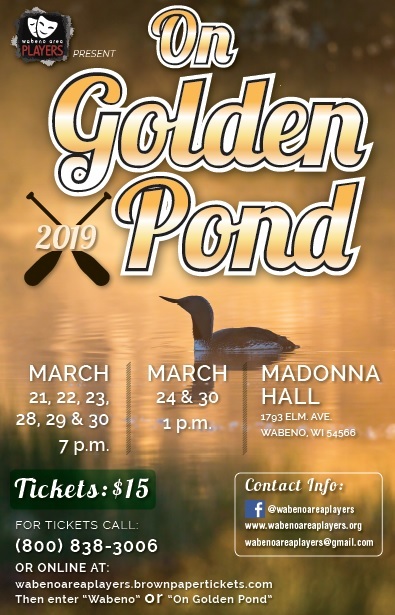 The scholarship is open to students in the school districts of Crandon, Laona, Wabeno and Goodman/Armstrong Creek who are freshmen, sophomores, or juniors at the time of the application. 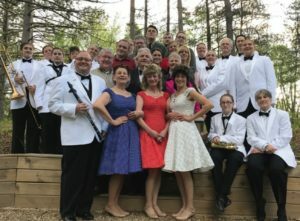 The scholarship is open to applicants who wish to attend a fine arts workshop, clinic or camp (music, art, theater, forensics, etc…), and who agree to attend the entire camp. Applicants must include a camp brochure or information from the camp/clinic/workshop. A letter of recommendation must be included with the application. This should be written by a teacher, administrator, or fine arts extra-curricular coach and should stress the student’s dedication to their art, academic strength, and good attendance record. Applications must be received no later than April 1 and scholarships will be awarded on or before May 1. The decision of the committee will be final. Questions may also be directed to Laura Bobbe 715-674-6705, Carol Bartlein 715-473-5466 or Jackie Enders 715-674-4061. 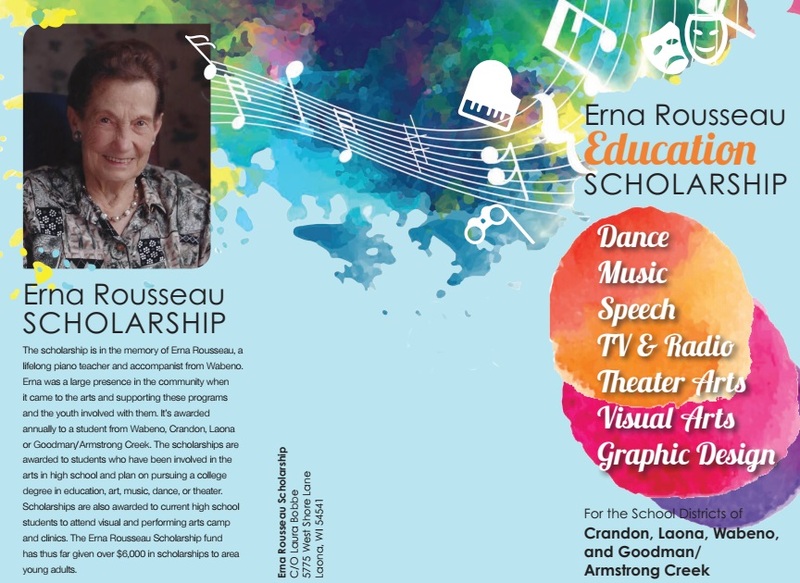 Correspondence can be sent to: Erna Rousseau Scholarship, C/O Laura Bobbe, 5775 West Shore Lane, Laona, WI 54541. This is the only local scholarship designed to give to students that participate and excel in the arts. 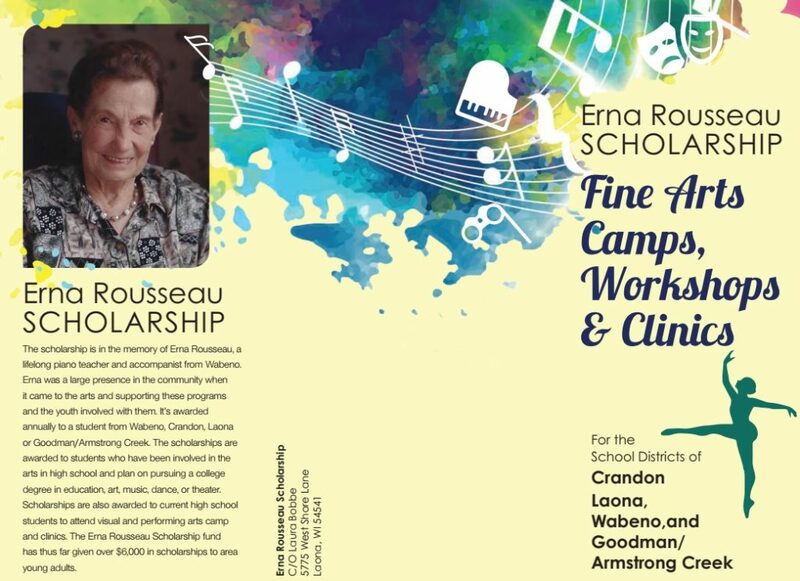 Wabeno Area Players is the financial fiduciary of the Erna Rousseau Scholarship. This 501c3 organization raises funds throughout the year for the scholarship. If you are interested in learning more about the Wabeno Area Players and would like to give to the Erna Rousseau Scholarship, please use the contact information below. All donations are tax deductible.